Fantastic Review Tanveer and Vidyut. Rating it 5 stars without doubt!! Though this seems to be a decent offering from Renualt, honestly, Lodgy does not come up trumps in any of the departments. It can be a workhorse and work all day, without probably giving any pleasure to its owners!! 5) The old school push type lock mechanism of the rear door. the list would go on. Honestly, I am more disappointed than elated with the effort from Renault. 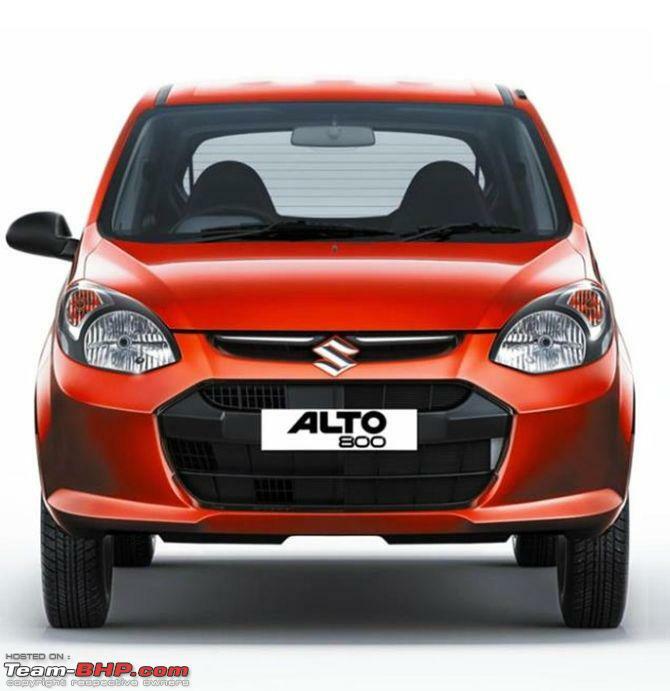 BTW, it is just me or do you too feel this- the front face(especially the headlight) has an uncanny resemblance to the Alto 800? Last edited by arnabchak : 9th April 2015 at 14:49. Ah well, the review is here! The car is often considered to be the first MPV. The very first. Believe it or not- The first generation of the Espace (the very original ) was assembled in India. Renault- is well and truly, the master of the phenomena known as MPV- Multi Purpose Vehicle. The Espace was a champion! The Lodgy- Here's wishing it a lot of luck! Last edited by FINTAIL : 9th April 2015 at 14:53. Interesting! Where and how many are on the road. I never saw one! A very balanced and detailed review.Kudos!!! The car seems to be ticking alll the boxes other than the middle row seat. Please note that, in a large family it is the women who generally take up the middle row seat(On shopping and Long trips) and the limited middle row leg room will not be a dampener for them (for an average height Indian Female). That said, a sliding middle row would have been a fantastic addition and would have made this the ultimate people mover. Probably something for the next facelift. A great MPV nonetheless and can take a shot at Innova!!! Wonderful detailed review and thanks a lot. Renault has ticked lot of boxes and missed few. Of those missed, things like climate control, basic headlight switch etc. won't be missed by taxis. But what Renault might be considering a fix to is the middle row pretty soon. It shouldn't be very difficult to provide sliding options, I suppose. Overall, happy to see some fresh air (Mobilio was supposed to be that, but turned out to be a disappointment) in this segment. Thanks for a detailed and well written review. As usual with fantastic pics and an eye on detail for every aspect. Renault have done their part well this time - after some basic points were given a miss on Duster. Let's see how the market responds. Personally I feel every product must have a worthy competitor - not only this breaks the monopoly, but also it lifts the standard and forces every game-player to think for the betterment within the segment. Let's see how people accept the Lodgy, and also does it affects Innova sales numbers. June/July sales analysis report will make the picture clear. Lovely review had me glued. As a probable customer for a 7/8 seater, the sliding middle seat is a big miss. Renault, change this please. Will wait for the refresh model. Rest everything seems in place, including the pricing. You seem to have answered most of the questions that arose after reading the initial report of launch. Lovely. Thank you for the detailed review. I think the 'Chief Competitor.' section nicely summarizes how the Lodgy seems to be a little bit of everything else in the segment. Did not realize that the pricing is below the Duster. That is very good pricing. Lack of Climate control is a surprise considering all the other nice to have features it has. The touchscreen unit looks a little strange. Not seamlessly integrated. Is the map support via a micro-SD or is it built in? Sorry to be a spoilsport for some folks here, but I dont really see how the Lodgy can be viewed as a serious threat to either Innova or Ertiga/Mobilio. - Probably, the first and foremost concern of anyone buying an MUV over an equivalent sedan or compact-sedan is the space and practicality. All 3 above have it beat here. Cramped last row may be acceptable for families with kids, but a cramped middle-row is acceptable for nobody. - While it might be more car-like compared to Xylo, even equivalent to Innova, it cannot beat Ertiga and Mobilio, which are built on sedan plaftorms, rather than SUV ones, when it comes to squeezing into tight parking spaces, and maneuvering narrow, crowded roads. - Long term reliability, ease of maintenance and ownership costs are nowhere in the same league. The MUV segment is designed for space and practicality, and the Lodgy scores on neither point. It tries to be different, but it lands up in no mans zone in the middle. The Duster was a hit because it was a unique product and a first in its segment. But the Lodgy has got some very serious and established/proven competitors. It will be difficult to get the general public to shrug that off and buy it. Nice review though in my opinion more detailed information on engine front and driving dynamics was needed. Over all like the boxy looks of the MUV, certainly better looking than Mobillo in my opinion. Very well written review tsk1979 and Vid6639. Absolutely to the point and a true example of T-bhp quality. Congrats to both of you. The car looks good externally sans the rear and the better build means Innova has finally got some company. It may not be able to dent Innova's reputation and fanbase but it will make Toyota sit up and take notice. Let's see how the market responds. Price wise Lodgy has everything a customer can wish for and if the service quality improves, it can sell well. I wish the tyres were wider though. Guys, you made me miss my lunch!! Just when I'm about to leave for lunch, I see the review up on the home page . Amazing review though. Loved the attention to the minutest of details and the pictures to go with it. The comparison with Innova was the icing on the cake. 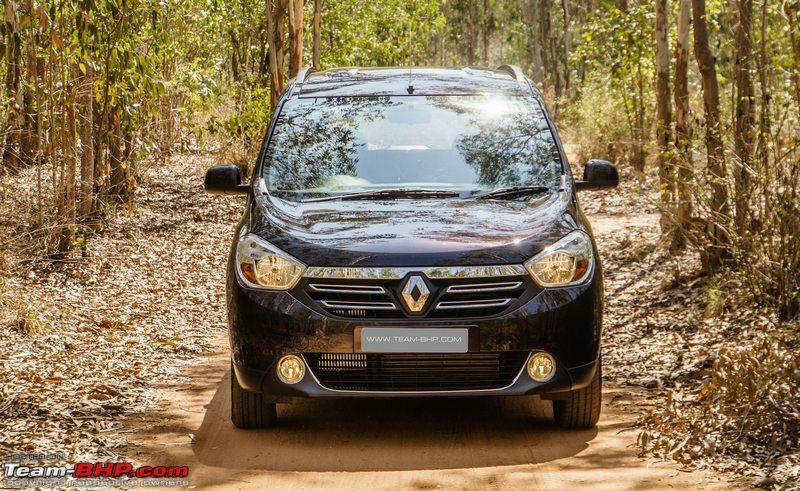 I feel the Lodgy is a well rounded product from the Renault stable, much better than the Duster. It is definitely better than the Mobilio, which I feel is grossly overpriced and has glaring cost cutting. But I cant help but feel that majority of the sales will be from the Taxi Market once the lower trim levels too are introduced. Let's wait and see what numbers does this achieve and whether it gives the segment leader Innova a tough competition. Just a question though, I noticed on the headunit that the review took place near Whitefield, ITPL area. How was the maneuverability and response on the crowded roads and B2B traffic? Just a glance through the "Rants on Bangalore Traffic" thread reveals that this area is one of most hit with Traffic Snarls. Very comprehensive review. I'd like to see what DC does with all the space. I have a feeling if DC has a mod for this (am pretty sure he will); then it might make sense to have all the bells and whistles in this car if you are being chauffeur driven rather than in the Innova - heck, a DC modded Lodgy might cost you as much as a top of line Innova. I am not sure about the name though; what does the name "Lodgy" signify anyway? Thanks for the fantastic, detailed review. Looks like a worthy competitor to the Japanese. I'm quite OK with the design. Definitely multiple areas of improvement over the Honda but my sense is the rural people movers would probably still stick to Maruti or Toyota. Given the higher average per day usage of MPVs typically, better dealer network is must for niggles and maintenance - esp for the commercial segment.